It’s that time of year again… Wimbledon, Hampton Court Flower Show and sunshine every day… It must be summer!Your favourite summer tipple, Gin and Tonic, Pimms or a glass of Rose wine are enhanced by the addition of beautiful borage flowers. Borage really easy to grow from seed. It’s a hardy annual herb which needs well drained soil in sun or partial shade. Plants grow to about 50cm to 1 metre in height. 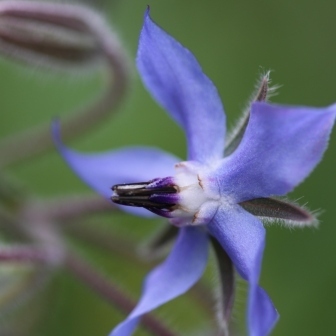 TIPS: Scatter the seeds where you want borage to grow because it dislikes being transplanted. If you leave a few flower heads on your plants at the end of summer they will self seed after flowering. The plant has distinctive hairy leaves and stems. Beautiful bright blue starry flowers appear for a long period over the summer months. They can be added to salads or crystallised and used to decorate cakes. I prefer to freeze them… one flower in each compartment of an ice cube tray… then use them in luscious summer drinks such as Pimms, Rose wine or Gin and Tonic.